Nordlund, K. I.: Blad ur Närpes historia. Första delen. 1928. Source of this collection. Owner's Marks from Närpes 1730-1838. The village of Pelo Owner's Marks used by members of the Pelo family. June Pelo: An Owner's Mark (bomärke in Swedish, puumerkki in Finnish) is a legal symbol, a geometric conbination of lines, used to show ownership or interests. It does not always mean that the owner of the Owner's Mark could not read, but it was similar to the coat of arms owned by the nobility. It was a person's visible symbol and applied to the property of a farm or an individual. In olden days the Owner's Mark was a symbol or brandmark which was used to show ownership. One had to choose an existing example as a symbol or brandmark, such as a rune. It then had to be approved by the other villagers. Owner's Marks have been used as early as 500 A.D. An illegal use of an Owner's Mark was a serious crime in the Swedish law during the period 1347 to 1442. The law of 1798 decreed that every document signed with an Owner's Mark should also be signed by two witnesses. Owner's Marks were found wherever property and interests were marked. Today many Owner's Marks are found in archives of church records. Many farms have saved old contracts of sale with Owner's Marks. Owner's marks are found on various objects. They do not indicate a year nor show the names of owners. Almost all Owner's Marks in archives are accompanied by the name of the owner and the year when signed. The oldest Owner's Mark in Finland is one on a tombstone from the 13th century, found in Ulvila parish, SW Finland. During early years of the study of Owner's Marks, researchers realized they could be used in genealogy. 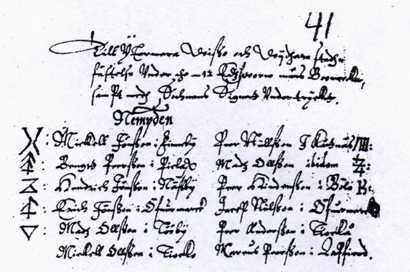 Many Owner's Marks, especially in Germany, were inherited from father to son. Certain types of Owner's Marks were typical for families or clans. Many times Owner's Marks without accompanying names are found on documents which show to which families the mark belonged. Because women used Owner's Marks belonging to male relatives, kinships may be found. P. O. Ekon puumerkkikokoelma Anneli Mäkinen. Aninkainen 1997:3, s. 11-12. Till yttermero visso och vijdhare stadsfästelse under (the) - 12 edsvorne mäns bomärken, jemte medh sochnens signeth undertrycht.